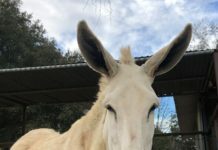 If you’re struggling with hoof issues, don’t fool yourself into thinking that merely trimming more frequently is going to be a magic fix. There’s always a learning curve and there are often kinks in that curve. The key to lameness prevention, rehabilitation, and continued development is keeping the outer wall off of the ground. To accomplish this, I believe that optimum weight bearing is when the inner wall is loaded at the Four Pillars. I don’t try to make it happen in one trim. It’s built over years of frequent trims. After trimming to the inside of the inner wall, it takes three weeks for the inside of the outer wall to make it to the ground (with this kind of trim), which is why I try to keep them on no more than a 3-week trim schedule. 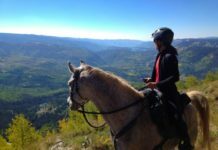 The second and third weeks are the optimum comfort weeks for the horse. The inner wall, through its attachment to the sole, is set up to support the weight of the horse. The strength of the outer wall is not in its ability to support the weight of the horse, but in its ability to contort while simultaneously resisting the forces of contortion. Frequency is only part of the equation. The trim has to unload the outer wall and put the majority of the horse’s weight bearing comfortably on the back of the feet. Correct weight bearing and movement is what heals feet. The trim just sets the horse up for healing. 1/16″ of vertical error at the ground equates to 2 inches of horizontal displacement at the wither on an average size horse. Too much weight bearing on the forehand causes excessive toe loading. When the lateral heel on a left front foot is continually being left 1/8″ longer than the medial heel it causes the horse to shift their weight 4″ to the right. This places the right front 4″ closer to the midline of the horse. This results in the majority of the horse’s forehand weight being supported by the right front. Most horses are already too much on their forehand due to the lack of knowledge about the relationship between proper heel shape and caudal soft tissue development. 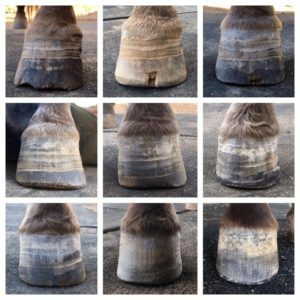 A horse that has natural downhill conformation and who is also naturally right forelimb dominant can be a disaster in the making. The right front becomes the crutch for the horse, resulting in mechanical founder in the right front. The symptom may be wall separation and/or sole penetration but the cause is 1/8″ margin of error in the trim. This is not a disease; it’s a breakdown in the mechanical bond from excessive force. 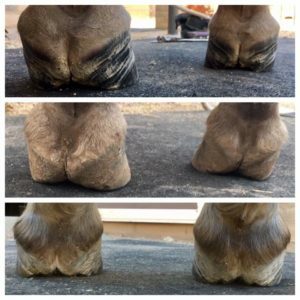 Keeping the horse properly squared up over their heels is how you fix them. Example of improper trimming for founder. When you’re rehabbing founder, you’re essentially taking the horse back in time through all the phases of their foundering. 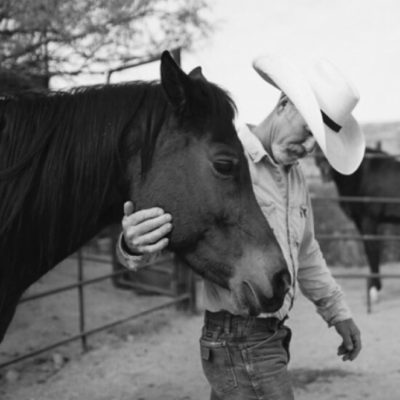 Helping a horse get comfortable is only the beginning of restoring them to a point where continual development is sustainable. 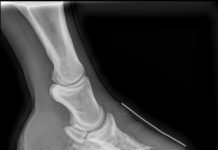 This is the right front foot of a right hand dominant horse that foundered due to improper trimming. These photos show 7 months of progress to reverse the damage. This is a caudal view of the same horse. Don’t rely on frequent trimming as the magic fix. And finally, be upfront how an issue will be handled. The trimmer should have a couple back up plans and the owner should be clear about how willing they are to go the distance if plan A doesn’t work out.